NFL Role Models – Where Did My Brain Go? I follow one sports team, New York Giants. I expect the New York Giants to win every game. I am thrilled when the Giants win. It does not matter if they win a pre-season game or the Super Bowl. My elation evaporates after a Giants loss. I was nearly inconsolable last season, after Giants started lost their first six games. Giants are 0-2 this year. Negative players have been one of their problems. One of the Giants best players contributed to the team’s decline. In 2008, Plaxico Burress caught the winning pass in the Super Bowl. Overall, Burress caught 244 passes for the Giants, and only lost 2 fumbles. Burress should have been playing for the Giants last year. He signed a 5 year contract extension before the 2009 season. Burress was not playing because he released by the Giants, after he shot himself in a bar. Giants also missed Will Hill. Hill was once selected as the best American high school safety. However, he was not drafted. Hill did not play in 2011. I accept full responsibility for this situation, and it won’t happen again. Sadly, Hill was suspended for the first four games of the 2013 season, because he tested positive for marijuana. you can’t really depend on Will to help us out and to really do anything for us if you’re suspended repeatedly, season after season after season. The Giants were lucky. Will Hill is talented, but he was not an integral part of their weekly game plan. The Cleveland Browns lost Josh Gordon for one year. Gordon led the league in rushing last season. He also claimed he was exposed to second-hand marijuana smoke. It’s a blessing just to play on any team. I’m just taking it one day at a time. The Ravens are used to suspensions. Three Ravens were arrested during a 22-day period this year. However, Hill’s six game suspension for “second-hand smoke” drew attention to Ray Rice, Baltimore’s leading rusher. Rice was suspended for two games after he knocked out his fiancée with a punch, in an Atlantic City casino elevator. Rice was indicted for third-degree aggravated assault. He faced at least three years in prison. The Ravens wanted Rice on their team. 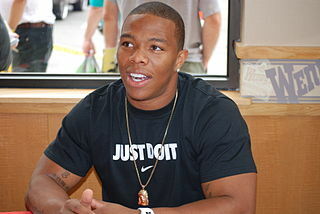 Ray Rice was a key player on the Ravens. Rice was part of every game plan. The Ravens had four running backs on their roster. If they lost Rice, the other three running backs had a combined eight games of experience. The Ravens released a statement, an hour after Rice’s indictment. We know there is more to Ray Rice than this one incident. Nobody mentioned Janay Palmer, Rice’s formerly unconscious fiancée. I would encourage my daughters to leave an abusive partner immediately. Ray and Janay have a baby daughter. How can a woman raise a child with a father who knocked her out? Janay Palmer married Ray Rice, one day after his indictment. It reminds me of an episode of Law & Order, because a wife cannot be forced to testify against her husband. Rice enrolled in a pre-trial intervention program and was sentenced to a year of probation. NFL Commissioner Roger Goodell suspended Rice for two games under the NFL Personal Conduct policy. Rice lost his salary for three games, because it was determined that his crime occurred during the 2013 season. It’s not a big deal. It’s just part of the process. We said from the beginning that the circumstances would determine the consequences. There are consequences when you make a mistake like that. I stand behind Ray. He’s a heck of a guy. He’s done everything right since. He makes a mistake. He’s going to have to pay a consequence. It’s not a big deal to knock your wife out in an elevator, if you can be my starting running back for 14 games. It became a big deal, after Will Hill joined Rice on the Ravens. Hill’s six game suspension for second-hand marijuana smoke, which is legal in two states, was ridiculous. His new teammate, who was facing three years in prison, was only suspended for two games. It became a bigger deal after TMZ released a video of Ray Rice’s elevator knockout. Casinos film everything. We knew that Ray Rice and Janay Palmer entered an elevator, and Palmer was unconscious when they reached their floor. I do not know why the TMZ video made a difference. The Ravens released Ray Rice a few hours after the video surfaced. They offered to exchange Ray Rice jerseys the following day. Commissioner Goodell gave Rice an indefinite suspension. Gregg Williams received an indefinite suspension for offering players cash rewards to hurt opposing players. He returned in a year. Michael Vick was charged with the “victimization and killing of pit bulls.” Vick returned from an indefinite suspension, and endorses Nike products. NFL players and personnel should be role models. The worst role model is Roger Goodell.